In 1934, eleven-year-old Shimon Peres emigrated to the land of Israel from his native Poland, leaving behind an extended family who would later be murdered in the Holocaust. Few back then would have predicted that this young man would eventually become one of the towering figures of the twentieth century. Peres would indeed go on to serve the new state as prime minister, president, foreign minister, and the head of several other ministries. He was central to the establishment of the Israeli Defense Forces and the defense industry that would provide the young state with a robust deterrent power. He was crucial to launching Israel's nuclear energy program and to the creation of its high-tech "Start-up Nation" revolution. His refusal to surrender to conventional wisdom and political norms helped save the Israeli economy and prompted some of the most daring military operations in history, among them the legendary Operation Entebbe. And yet, as important as his role in creating and deploying Israel's armed forces was, his stunning transition from hawk to dove-with its accompanying unwavering commitment to peace-made him one of the globe's most recognized, honored, and admired statesmen. 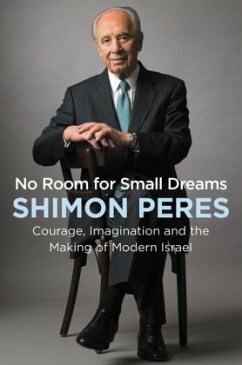 In this, his final work, finished only weeks before his passing, Peres offers a long-awaited examination of the crucial turning points in Israeli history through the prism of having been a decision maker and eyewitness. Told with the frankness of someone aware this would likely be his final statement, No Room for Small Dreams spans decades and events, but as much as it is about what happened, it is about why it happened. Examining pivotal moments in Israel's rise, Peres explores what makes for a great leader, how to make hard choices in a climate of uncertainty and distress, the challenges of balancing principles with policies, and the liberating nature of imagination and unpredicted innovation. In doing so, he not only charts a better path forward for his beloved country but provides deep and universal wisdom for younger generations who seek to lead-be it in politics, business, or the broader service of making our planet a safer, more peaceful, and just place. Shimon Peres was one of Israel's founding fathers and for more than six decades was an architect of its ascent from a fragile state to a global power. In 1994, he was awarded the Nobel Peace Prize for his extraordinary efforts to forge peace between Israel and the Palestinians. In 1996, he founded the groundbreaking Peres Center for Peace and Innovation to focus on developing and implementing imaginative peacebuilding programs around the world. Peres died in September 2016, shortly after finishing his work on this book. He was ninety-three years old.